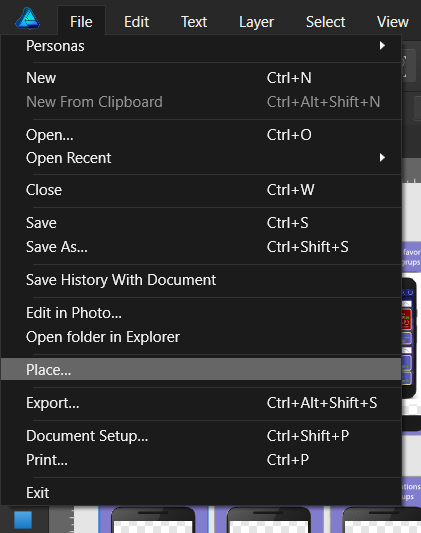 Button and keyboard shortcut for "Place"
I use often the tool "Place" and I see there isn't any button or keyboard shortcut for it. Is it possible to create this? Thanks very much!! That's what I need! not sure what was meant by "button" However, what would be nice if one could add tools and one good one would be Place. 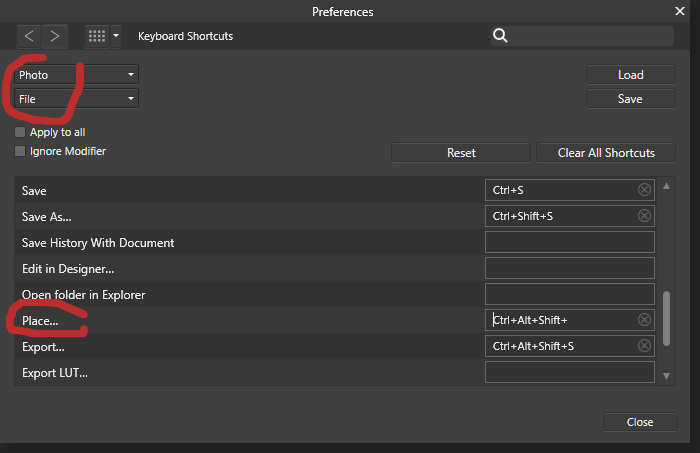 I looked at Edit>Preferences>Tools but did not see a means to add whereas adding to the Keyboard shortcut is fine as long as one can remember the shortcut lol. I have a good memory -- just short -- like my hair! Oddly, there is a Place Tool Panel icon available in Designer but not in Photo. It is kind of odd that Designer has one because Place is not really a tool; it is a File command similar to Open. My bigger problem is that when I use the place command to add a photo, Affinity always flips it horizontally! Any workarounds known, please? Scratch my earlier question... or do I take it from the lack of response that it was a stupid question, anyway? I find that if I drag the place icon from the right it puts the image back to front...if I drag from the left of screen it is the right way.